Beauty Vixen: CoverFX Say Yes To Skin Tint! Say No To Skin Cancer! CoverFX Say Yes To Skin Tint! Say No To Skin Cancer! 80% of all skin cancers are caused by over exposure to the sun and/or sun beds? One of every three cancers diagnosed is skin cancer? 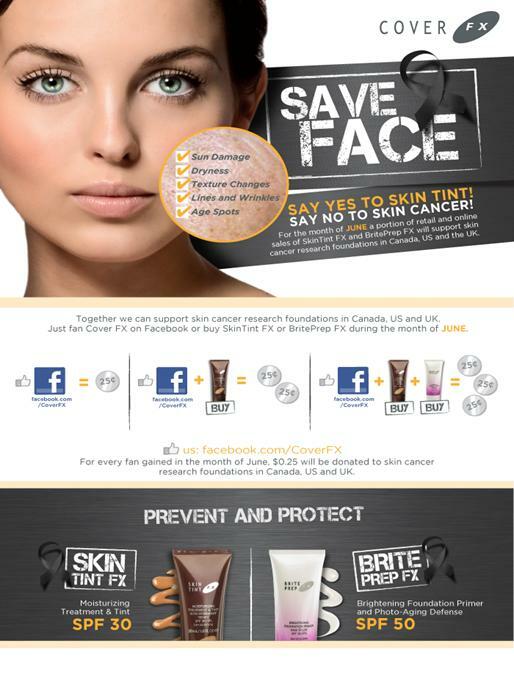 There are over 13 million cases of skin cancer diagnosed annually? Melanoma is one of a handful of cancers where in the incidence in Canadians continues to increase? Alarming isn't it? That 80% of the cases of skin cancer could have been prevented? CoverFx makes some amazing products with high SPFs to protect your skin from sun and it's harmful rays. My personal favourite is Brite PrepFX with it's 50 SPF as a primer in the summer. Skin Tint is also amazing for the hot weather and because it has an SPF of 30. I know quite a few people effected by various types of skin cancer and the statistics are quite startling when you read them. I really am an advocate for proper sun care so that we can prevent this needless damage and the illness from hurting more people. For the month of June CoverFX is donating money to several different fund across Canada, The United States and The United Kingdom that raise awareness for skin cancer. In Canada it is the David Cornfield Melanoma Fund. How the donations will work?